There is one most heard comment made on India's lost opportunity in electronics and semiconductor manufacturing, that is "we missed the bus". Where the bus is compared to the short window of opportunity. Compared to PC-era market, in today's electronics of everywhere and to everyone, the window of opportunity is India centric, due to its sheer size and growth. India becomes important differentiating factor for highly competitive electronics and semiconductor companies. Another trend is electronics manufacturing is getting commoditised faster. Taiwan, China, South Korea, Malaysia, Thailand and Philippines are all big names in electronics manufacturing. This time the opportunity-bus is still under India's control. So India suits well both for high tech manufacturing as well as commodity like factories. Since India cannot do all on its own in short span of time, it has to go for large-scale investors in infrastructure, testing ,and design and manufacturing. So India's offer to investors itself is a bus of opportunity for global leaders to beat their competition by entering Indian market. It applies even to India's big corporates. For instance, we need software companies who can design the software products such as operating system in India and customise for Indian requirements and users and they cannot end the customer-support for the sake of protecting economies of some other region. Good example is, many millions of Windows XP users may soon (April 2014) face security and instability issues due to end of support from Microsoft. It applies even to the x86 based PC hardware, which only designed to last 4 to 5 years. Even if the customer maintains very well, they cannot load Windows 8 OS to a computer hardware which is less in memory and uses slow-processor. This is not good for many Indian SMEs. Microsoft has now hired Indian born Satya Nadella as its CEO. We have to wait and see whether Satya Nadella can bring some win-win changes to the product offerings. Satya Nadella has a great growth opportunity for Microsoft in India by reforming the Microsoft to support the emerging new wave of software/system requirements, where the trend going to be digital inclusion rather than digital division. The agriculture farmers in India ready to own $50 worth (close to the price of Akash tablet) mobile piece of computer system to know information related to the crop and other daily essentials. Local language support, a new user interface and hassle-free secure connection can drive a new wave of devices in India. Present technology supports voice based input, where illiterate/less-educated can learn and access things on-par with educated through voice interface. There is a big-big opportunity for electronics innovator in this kind of voice enabled speech recognition technology based electronics devices. India is a hotbed for this market because of the huge number of languages and accents spoken in India. Google and Apple are already ahead of Microsoft in voice technology interface. With India having DSP and embedded software expertise combining that with embedded memory technologies, and a team of cross discipline language experts -- a lot of patentable IPs can be created in this domain. If every content is digital audio/video type, imagine the level of complex silicon and software required, there is a huge opportunity. 16/14nm and 3D semiconductor fabrication is must for that level of integrity. If Microsoft and big product OEMs doesn't wake up to these requirement, there is a plenty of opportunity for many software and system companies to jump into this opportunity. Same thing applies for many electronics and semiconductor companies. Many Chinese companies were smart enough to utilise the Indian market opportunity and shake the Indian market to their benefit. India has all the capabilities to take the share away from Chinese manufacturers in many of the areas, except for some commodity components where India do not have the raw materials such as copper-based products. 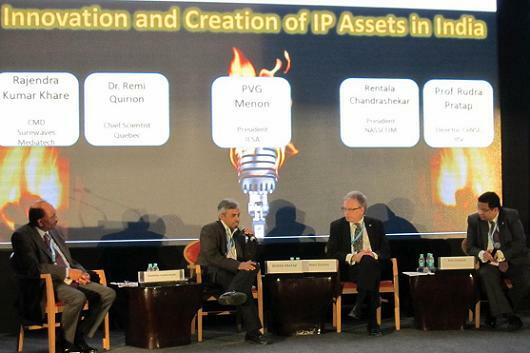 But in the areas of high-tech manufacturing such as semiconductor fabs, display panel manufacturing, and such areas where India doesn't have the intellectual property, India offers great opportunity for global leaders to make India as a base both with domestic market benefits as well as export market benefits. The two semiconductor fab proposals which are expected to start the construction work for building the fabs within 3 to 4 months, are going to reap the huge benefits in the coming years. The big investors have expressed their displeasure in investing in India in multiple areas. The government of India has taken note of all these concerns, they have aggressively addressed all the relevant concerns. 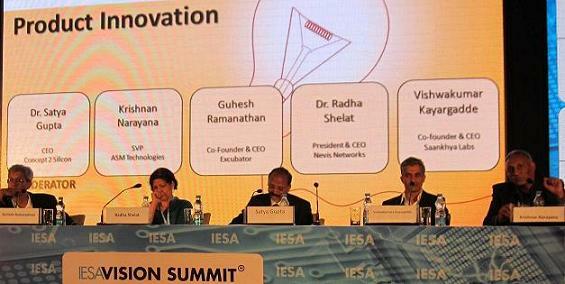 At the recently concluded India electronics and semiconductor Association (IESA) organised IESA Vision Summit 2014, some delighting facts and some concerns also emerged. Electric power is no more issue now. 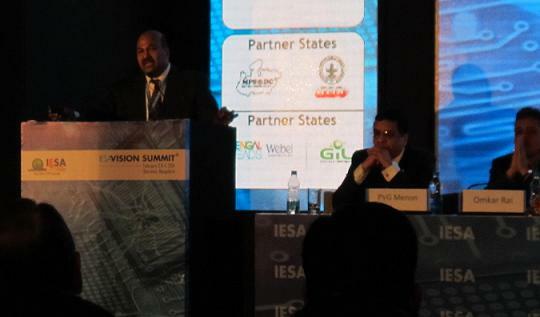 The senior officers from states of Gujarat, Maharashtra, Andhra Pradesh, Odisha, and Madhya Pradesh presented the infrastructure facilities available for ESDM (Electronics System Design and Manufacturing) sector in those states at IESA Vision Summit. Most of these states are power surplus, they are already selling power to other states. In Gujarat and Noida (Uttar Pradesh) water is not a issue for semiconductor fabs. If the investor goes one step in investing, most of the states ready to go two steps in fulfilling their requirements. They are extremely interested in supporting big as well as small investors. Based on the investment, they are range of incentives on land procurement, employment rules relaxation, or any such infrastructure related Performance based incentives. Vision Summit event attendees could feel the commitments from the Government officers to fulfill the requirements. Even the Andhra Pradesh, where the problem of state division issue hurting its image, they are shielding the IT and electronics businesses not to get affected by strikes. Except for the power shortage, Andhra Pradesh continues to attract investors not only in Hyderabad but across the state. Karnataka, the most attractive for many businesses is not letting any small thing to affect its image as the best investor. Though both Karnataka and Andhra Pradesh slightly power-starved, they are trying hard to become power surplus. Tamil Nadu, Kerala, Haryana, Delhi, Uttar Pradesh (mainly Noida), West Bengal are all competing for the investors. This infectious competition is spreading all across India, which is very good to address electronics device market of US dollar 400 billion by 2020. At the event, S.R. Patil, Minister of Information Technology, Government of Karnataka expressed his interest in evaluating infrastructure facilities for semiconductor fab most probably in North Karnataka, where water is not a big issue. It is very clear, the infrastructure up gradation is really going very fast across the Nation. There are multi-state industrial corridors to support different industries. One of the corridor links Chennai to Ahmedabad, connecting Bangalore, Hyderabad, Pune, Mumbai, and many tier 2 and Tier 3 cities. In our earlier articles on this subject, we always used to criticize the infrastructure problems across the country and only highlighted the talent potential in India. It looks like if the growth picks up, India may run short of some section of quality talent/workforce. Government is planning on that front also to increase the PhDs as well as technicians for manufacturing. On the India's manufacturing experience in last two years, There were totally 4 presentations by professional companies such as Sanmina, Nokia Siemens, Johnson Controls, and SGS Teknics. The biggest issue highlighted by all these manufacturers was poor supply chain of components in India. Not just semiconductor ICs, they face problems with sourcing passive components, and discrete semiconductors. They are fairly satisfied with quality of electromechanical connectors, and mechanical assemblies and enclosures from domestic manufacturers. The delay in getting components is big issue both for big and small companies. There are hardly any big distributor in India stocking components in India. There might be some disadvantages for them to stock here or some advantages to stock in places such as Singapore and Hong Kong and such electronic component hubs. India needs one such hub, it is easy to say rather than implementing it because, Singapore is extremely efficient in such businesses. Government can enforce some minimum level of stocking in India based on the size of the distributor by evaluating their intentions of not keeping stock in India. They can not complain on the infrastructure much except on few things like city traffic congestion, and public transport. So this is a block which government and industry has to address immediately, when this writer interacted with leading component distributor Avnet, they said they charge and accept the payment from the customer in US dollars not in Rupees. 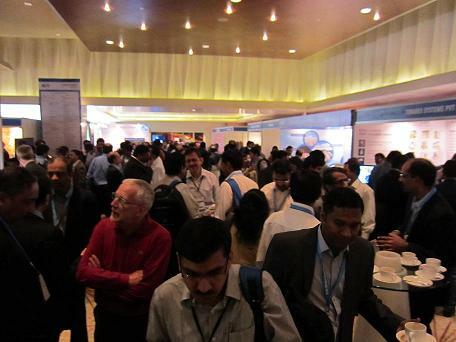 When I asked Avnet's executive why can't they stock in India, the answer was not impressive. Government can investigate this and find out solutions to help many Indian companies, particularly small start-ups to buy electronic components in Rupees. However small quantities of some mature and popular components are sold to service engineers and electronic engineering hobbyists in Rupees. But to buy a latest semiconductor IC or a product differentiating device released in the US or European market from such retail vendor is difficult. There are small distributors in Sadar Patrappa Road Bangalore, who give better service than Avnet's and Farnell's for micro enterprises in electronics. But the problem with small shops is they some time selling low quality or fake/counterfeit parts. Chip manufacturer itself make a note saying the new IC is sampling only to selected customers. That's where many get a feeling that India needs its own semiconductor fab. From a panel discussion on electronics manufacturing, it was very clear the manufacturing abilities of Indian units are world-class, even compared to China or Taiwan. Combining the Indian design skill and manufacturing, India can become best region for ODMs. However component supply chain is a big issue, infrastructure also still need to be scaled further. One interesting suggestion came from Mr. Sanjiv Narayan, head of SGS Teknics, he said any component manufacturer in India who survived since early 80s and still making components need to be rewarded and star-tagged for their ability to withstood bad market conditions in last two decades. They must have gained huge experience now to serve the growing market better than others. Industry body ELCINA is a good source to know such vendors. If you look at the requirements of small and medium enterprises, they still face problems getting things cleared from the Government authorities for various material movement, and other certifications. This discussion on supply chain management immediately leads to the impact of semiconductor fab on the whole Eco. In a panel discussion on this subject, it was good to have DR. M J Zarabi, a person who really worked hard in building a semiconductor fab in India. The outcome of the discussion was, the fab has to meet the wide requirements of both small volume buyers as well as large volume buyers for wide applications. In this discussion attendees at the event rise the issue of availability of electronic design automation (EDA) software tools for tiny start-ups at subsidised price. Jaswinder Ahuja of cadence who chaired the discussion said, the Government is working on a model to make that available through incubation centres. Design software is going to be hurdle in future, because they may follow some kind of licensing model similar to what Microsoft trying to do with Windows XP. Unfortunately there is no design software company which has its IP in India. India's software industry and academia has a huge opportunity here to develop design software products otherwise can ask the software vendors to change licensing rules helping Indian market. Choice is limited here because there are only few dominant vendors in EDA domain. 'We can do it' kind of a cautious-confidence was seen both in attendees as well as speakers at the IESA Vision Summit 2014. There is reinvigorated passion for made-in- India electronics and is catching up faster. With the basics laid, its time to act with concentrated effort by Govt, Industry, and academia and every citizen. Lit the growth launcher with some ground breaking of semiconductor-fab manufacturing facilities, so the count down to take off get started. In this mission-mode electronics-growth launch-vehicle project, any glitch is not really technical, its more related to human judgment error in understanding market and economics and teamwork. Absolutely no corruption and nepotism both in Government as well as private sector, which can be a devil knocking off our launch vehicle of electronics(e) independence, a freedom from the imported electronics and software products, where India don't have control over many of its implications. e-independence is the mission word raised by J. Satya Narayana, Secretary Dept of Electronics and IT, Government of India. He also defined the goal by another term I3P3 (Infrastructure, Incentives, IP and People, Preferential Market Access, Promotion). S.R. 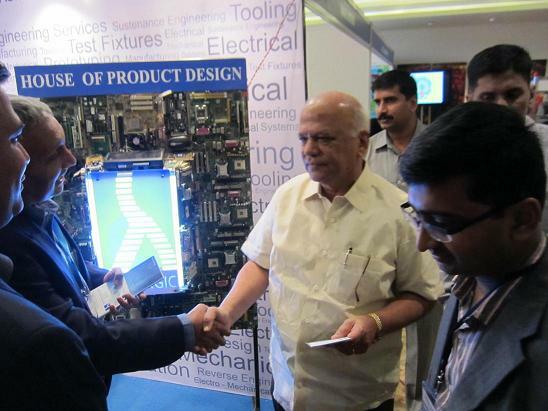 Patil, Minister of Information Technology, Government of Karnataka talking to an exhibitor at the event. Dr. Rudra Pratap, IISc sharing academia driven innovation for out-of-box product development.